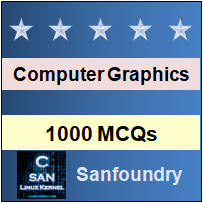 This section of our 1000+ Computer Graphics multiple choice questions focuses on Graphics Hardware and Display devices. 1. Which devices provides positional information to the graphics system ? Explanation: Input devices positional information to the system they often called pointing devices. Explanation: Number of pixels determines the resolution . Explanation: Frame buffer is mainly used to store pixels. Explanation: In CRT the filament is responsible for supply of power. 6.________ stores the picture information as a charge distribution behind the phosphor-coated screen. Explanation: Instead of refreshing, DVST stores the picture information behind the screen. Explanation: Emissive displays are devices that convert electrical energy into light. Explanation: Raster-scan system uses shadow-mask method because they produce wide range of colors. Explanation: The digitization process is called scan conversion. 10. Which display devices allows us to walk around an object and view it from different sides. Explanation: 3D display devices allows user to view the object from different sides. Explanation: LCD screen is refreshed at 60 frames per second. Explanation: Random-scan system mainly designed for Line-drawing applications. Explanation: The video monitor is the commonly used output device. Explanation: Bit map frame buffer is always 1 bit per pixel.